About a week ago I set several days aside for the task of scorekeeping. We had good representative data to begin the task, mostly coming from the Top Dog league run by Jane McManus at Pine Meadows Training Center this past winter; and assorted others who participated. Within a week or so TDAP will be awarding the first agility titles for the organization. I’m sure that will please Jane. Many of her students are Teacup Dogs enthusiasts… and so they’re used to more instant gratification. You must be aware that we are inventing the systems for scorekeeping as we go along. It is more daunting and complicated than it might seem. 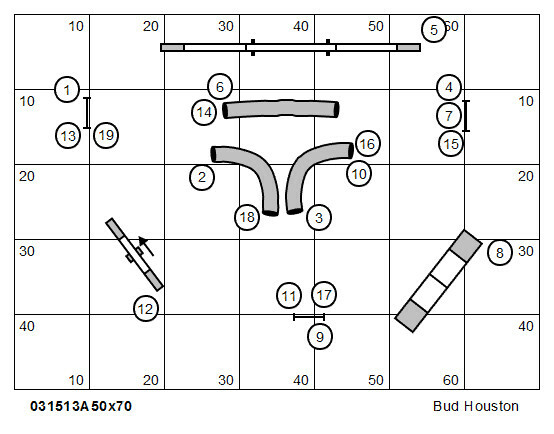 This is a numbered course for a 50‘ by 70‘ space, or larger. … and this is a numbered course for a 60‘ by 90‘ space, or larger. Note that the two are nested; the equipment being in precisely the same place as the “A” course above. 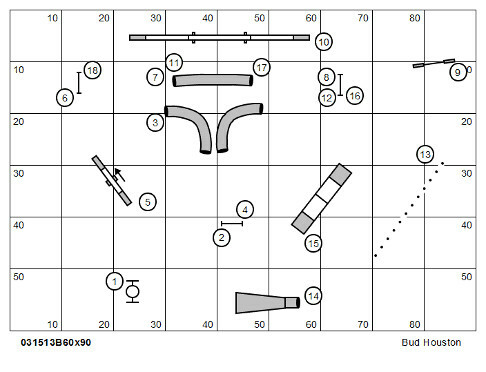 When we run the first course we’re allowed to move out of the way the #9 jump you see in this course map, as well as the tire. These obstacles were never intended to be a part of the challenge in the original design.